Spritely won the Most Likely to Succeed award in Healthcare and Field Force won the Best in Class award in Agriculture. Startup Weekend Ventura County (SWVC), an economic development initiative founded by Dignity Health St. Johns Hospitals, Camarillo Chamber of Commerce and Ventura County Government, held its second annual event on April 21-23 at Rancho Compana High School in Camarillo. Over 80 entrepreneurs signed up for this event. On Friday April 21st, 35+ technology startup ideas were presented. After the audience had cast their votes, 14 moved forward to form teams to develop proof of concepts. Throughout Saturday April 22nd and most of Sunday April 23rd, a group of 15 technology, subject matter and business mentors showed up to provide counsel and advice to the contestants. Then on Sunday afternoon, a panel of 12 judges, made up of CEOs from significant local businesses presided over the competition. The idea that won the Best in Class award in agriculture was by Julio Orozco. He named his startup Field Force and his invention is to use floating mats, in regular hexagonal shape, on reservoirs to reduce water loss due to evaporation. The idea that won the Most Likely to Succeed award in healthcare, and with it a $10,000 check, was by Haley Jeffers, an eighth grader. 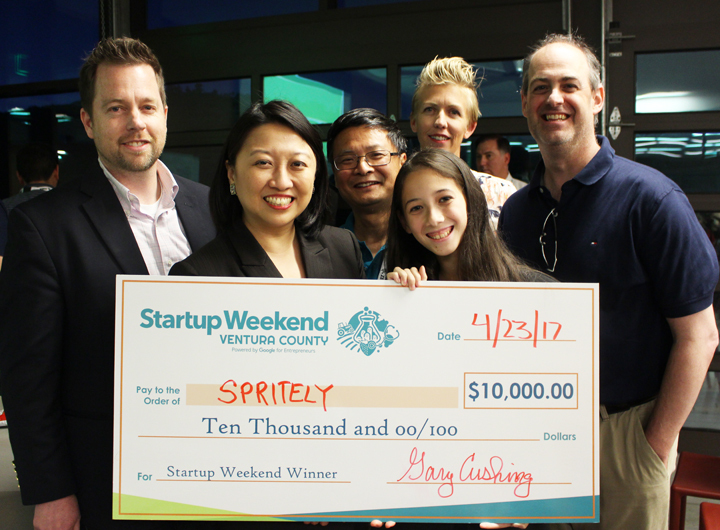 She named her company Spritely and her invention is to create a web service, delivered through a smart phone application software, that provides real time counsel on what and what not to eat to people with food allergy problems. The twelve members of SWVC 2017 judge panels were: Chris Meissner of Meissner Filtration Products, Mohan Maheswaran of Semtech Corporation, Chris Sullivan of Zebra technologies, Darren Lee of Dignity Health St. Johns Hospitals, Kim Milstien of Ventura County Medical Center, Ales Teague of Limoneira, Garland Reiter of Reiter Affiliated Companies, Alain Pincot of Bonipak, Michael Powers of Ventura County Government, Dave Nichols of Applied Wireless, Dr. Ross Dueber of Z Power and Daniel Schoenewald of Advance Motion Control.